August 15, 2014, MILLINGTON, Tenn. (NNS) – The fiscal year 2015 (FY-15) performance-based Senior Enlisted Continuation board will convene Oct. 27 according to a Navy message released Aug. 14. “There are no quotas for this board; it is strictly a performance-based board,” said Navy Personnel Command (NPC) Force Master Chief (SW/AW/EXW) Leland E. Moore. The board will look at certain performance indicators detailed in the board precept and on the NPC continuation page at www.npc.navy.mil/boards/enlistedcontinuation. As outlined in NAVADMIN 180/14, active component (AC) and Full Time Support (FTS) E-7 to E-9 Sailors with at least 19 years of active service computed from their active duty service date as of Feb. 28, 2014 and three-years’ time-in-rate (TIR) as of June 30, 2014; and selected Reserve (SELRES) and Voluntary Training Unit (VTU) E-7 to E-9 Sailors with at least 20 years qualifying service as of Feb. 28, 2014, and three-years TIR by June 30, 2014, will be considered by the board. 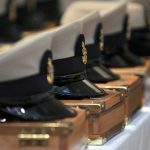 The Naval Education and Training Professional Development and Technology Center will publish the names of board-eligible Sailors Aug. 29. The names will be posted to the Navy Enlisted Advancement System website at https://neasos.cnet.navy.mil, and individuals can view their board eligibility profile sheet on Navy Knowledge Online (https://wwwa.nko.navy.mil). Commands will be able to review their FY-15 SECB listing for accuracy. If an eligible candidate is not listed, commands must contact NPC to make the required adjustment. Sept. 22 is the last day for commands to resolve eligibility issues. Letters to the board must be received by Oct. 6. See NAVADMIN 180/14 for submission procedures and mailing addresses. Board results will be posted on BUPERS On-Line for command access only, and commanding officers will be notified via a Personal For NAVADMIN when this occurs. AC/FTS Sailors who are not selected for continuation must transfer to the Fleet Reserve or retire by Aug. 31, 2015, unless operationally waived by the Deputy Chief of Naval Personnel. SELRES/VTU Sailors must transfer by Sept. 1, 2015. Sailors with an approved operational waiver must transfer by Nov. 30. For more information, read the message at the NPC website at www.npc.navy.mil, visit the NPC enlisted continuation page at www.npc.navy.mil/boards/enlistedcontinuation or call the NPC Customer Service Center at 1-866-U-ASK-NPC (1-866-827-5672).